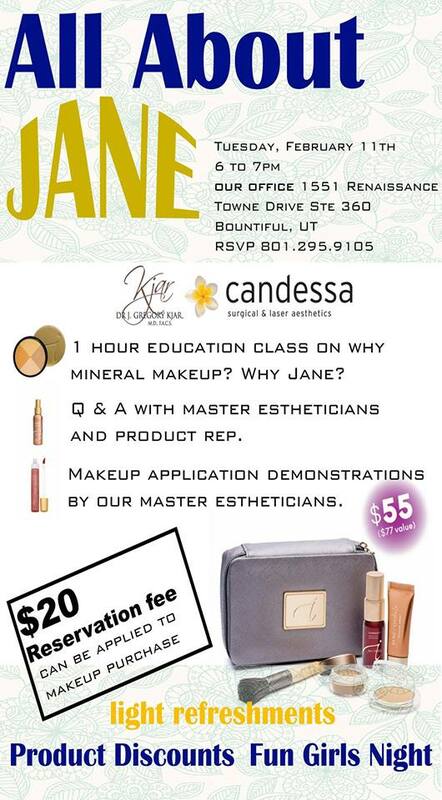 We are excited o announce that we are having a 1 hour class all about JANE IREDALE MINERAL MAKEUP. In this class you will be taught by two licensed master estheticians. 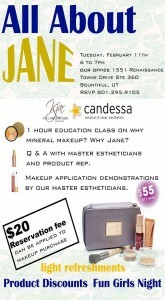 They will talk about what mineral makeup is, how jane compares to other mineral makeups and what makes jane unique. We will call a few people out of the audience for complimentary mineral applications. They are a lot of fun to watch. Everyone learns something from them. We will have a Q & A after the presentation is done. We will also have time to color match some individuals. Make sure that you show up first so that you can reserve your spot. Fun giveaway and food too! Hope to see you at our office on the 11th!